The Delaware River's Uplands extend from the Catskill and Pocono mountains where it bubbles forth as cool mountain springs and trickling streams, to Hancock, NY where its East and West Branches meet to form the main stem, which flows down to the Delaware Water Gap where it enters the Piedmont section of the watershed. Learn more about The Uplands of the Delaware River including fauna and flora, water quality and recreation. The steep slopes of the Delaware watershed's Piedmont end abruptly at the Kittatiny Ridge, with the 3,000-4,000 foot peaks of the Pocono and Catskill Mountains giving way to the gently rolling hills and sweeping valleys of the Piedmont. The difference between the two regions is dramatically illustrated as the River spills through the Delaware Water Gap, a narrow opening in the Kittatiny Ridge. Similar geologic gaps occur in the Appalachian ridges as several Delaware tributaries enter the Piedmont. 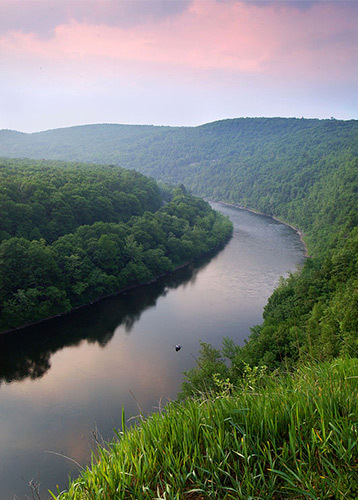 Learn more about The Piedmont of the Delaware River including water quality, geology and fish. The Delaware Estuary stretches 134 miles from the Trenton falls to the mouth of the Delaware Bay between Cape May, NJ and Cape Henlopen, DE. Approximately 8 million people live within the Delaware Estuary's watershed, many depend on it for food and drinking water. Learn more about The Estuary of the Delaware River and the areas where the river meets the sea.